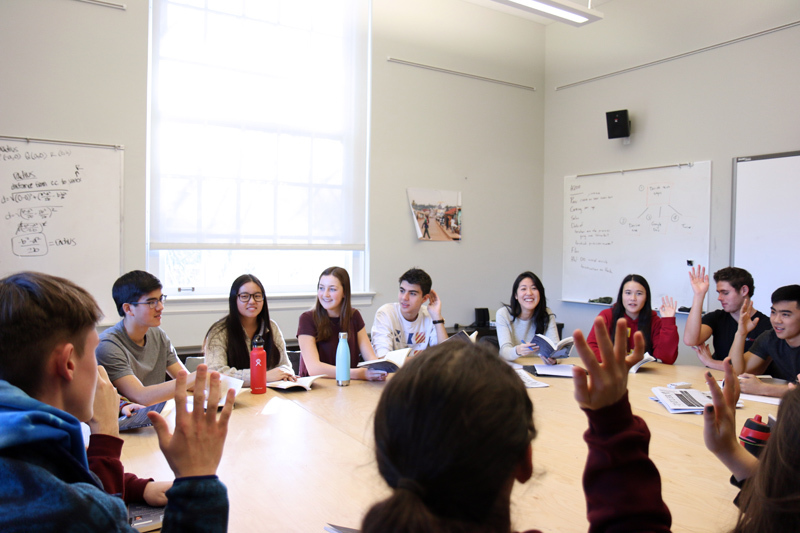 Upper School English teacher Emily Chu ’05 spoke with Communications Director Amanda Darling on how Lakeside’s mission-driven diversity and equity work plays out in her classroom. The following is excerpts from their conversation. Q: Emily, what do you focus on in your Multiethnic Literature class? I tell my kids at the beginning of the semester that the class name is a little bit of a misnomer. If it had a more accurate name, it would be something about intersectionality and identity… Identities intersect or overlap and that changes so much: the ways we’re perceived; the ways we experience the world; the ways we interact with systems around us. I want to make sure that we talk about lots of different facets of identity. So it’s race and gender and class and ability and sexual orientation and all the other different pieces… I want us to think critically about how all those things come together to form who we are. Q: How do you create a classroom where students can talk honestly about this material? We have to be the kind of people who will make the effort to make community with each other. That means holding each other accountable, being compassionate, listening carefully, asking questions, and trying to understand where everyone is coming from. We leave space for mistakes, because this work is inherently messy. No one gets it right. I have to apologize and reassess or rethink, all the time… We’re all operating inside our own little bubbles of privilege because we all possess some aspect of privilege, if not many. We’re not going to know we hurt someone until it’s too late; that’s how privilege operates. So we have to know that’s part of the work. And we can be the kind of space where that’s an openly acknowledged piece of the process, and we are all growing and learning and trying to be better. We don’t know everything and we’re just trying to figure it out together. Q: You do a lot of small-group discussion. What are students learning from each other? Small groups help students who are quieter and more introverted; it gives them a safe space to try out ideas… [It’s] prep space for the large group discussion. Student-centric discussions bring students’ different perspectives to the fore… Everyone here is a valued member of our collaborative learning process. Everyone is coming in with expert knowledge about something, especially their own lived experiences. To not hear from someone is a loss for all of us. And to not value everyone and where they are in their learning is a loss for all of us. Q: Something I noticed in your classroom is that students seemed more likely to ask questions than provide answers. One of [our class norms in Multiethnic] is “accept nonclosure.” The cool thing – in any class – is that conversations continue. Especially in Multiethnic Lit, it feels like we leave sometimes without answers. We’re asking the questions and we don’t know if we have the answers. Sometimes it’s important just to ask the question. At Lakeside we’re often so intent on finding answers; we’re intent on fixing. But how can we fix if we don’t actually know what the issue is first? Listening and hearing the various perspectives and concerns and questions is crucial work. I talk about asking and articulating questions across all my classes; that’s one of the skills that I try to give every one of my students. Q: What do you want them to get out of this class? At the very least, I hope they understand that there are things they know and there are things they don’t know and those things are mediated by power and privilege. And all of that affects the ways they live in this world and interact with other people, and the way the world interacts with them. What I’m trying to do is offer them a space where they can come as they are, and we make a kind of family together for a semester. We’re all these different people and we’re in this space together and that can be scary. But we’re going to make it work by being kind and by being honest and by being uncomfortable. That’s the work. Q: How has teaching this class affected your work with other classes? I try to imbue all of my classes with the same principles. I want to live out what [cultural competency] means, all the time, every day. For me, that means recognizing and valuing differences of all kinds and learning how to communicate across those differences in order to build sustainable, respectful, and meaningful community. We start by defining terms so we have a common vocabulary to build on. The last couple of years, I’ve made sure that all of my classes, regardless of age level, take the first week to do work around privilege and power... We talk through different categories of identity and different identifiers within those categories: which are privileged and which are historically marginalized. [This] serves as a baseline and then we keep adding to our vocabulary throughout the year. “Twelfth Night,” for example, is a Shakespeare play [we read in 10th-grade English]…. Shakespeare could be taught as just another dead white man from the canon. In other words, if we teach his plays by only looking at figurative language, meter, and themes like death and love, the implicit underlying message is that whiteness and maleness are the universal standards of human experience. I purposefully teach [Twelfth Night] through the lens of gender. So we talk about… the difference between gender identity and gender expression, about sexual orientation, romantic orientation, the different kinds of love people hold for each other. That’s a different type of conversation. 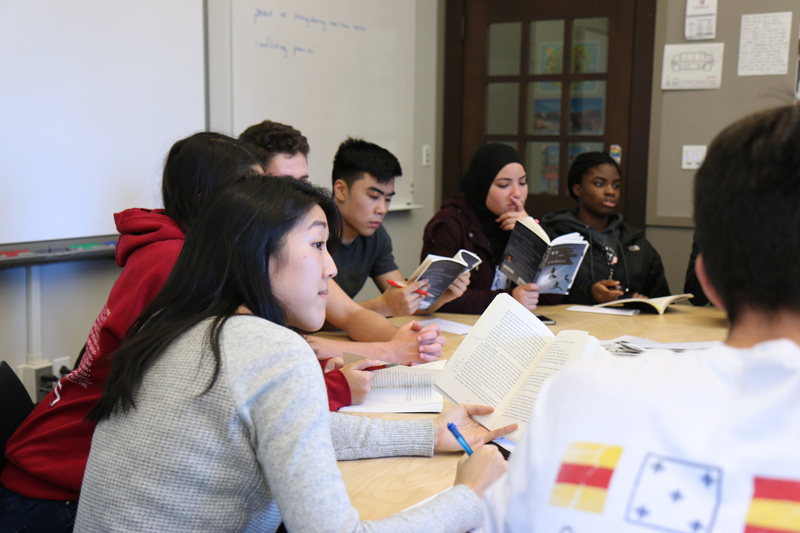 And then we read “Pronoun,” which is about a transgender boy who is starting his transition during high school, and which makes explicit references to “Twelfth Night.” We continue building on our shared vocabulary, making sure that we understand, what does transgender mean? What does cisgender mean? How are the characters having conversations about gender and privilege? Q: What do you hope for your students? What I love about the Multiethnic class is that it gives me hope about the future of this country. These students are committed to listening and to justice. It seems like [they] could be part of a cultural shift in how we all understand and talk about identity and power and privilege by carrying these frameworks and skills into the world beyond our classroom and by actively engaging with that world and the people in it through these lenses of understanding. I fundamentally believe that education is a tool to save lives. If we can give students the skills to be critically conscious; to ask good questions; to listen; to think critically about the information they’re given; to understand that nothing happens in a vacuum, that there is always a context, that there are always larger narratives, sometimes conflicting… If we can do that, then we are equipping them to go into the world and fight for and alongside each other and save each other’s lives.